Turn-of-the-century house, furnished with antiques, including spacious claw-footed bathtubs. Spend your time on the back porch for peaceful relaxation. Within walking distance of town. Continental breakfast included. Early American country home with a large porch to relax and look out over the beautiful scenery and peaceful atmosphere. Complimentary continental breakfast. Splendor Inn is your cozy home away from home in downtown Norwich. Choose from six spacious guest rooms in a majestic Victorian home within walking distance of local attractions, including the Northeast Classic Car Museum. Full breakfast is included and cooked to order. Fully renovated 1830's colonial home. All rooms have private baths. Very comfortable and relaxing home. Overnight guests find relaxation and comfort in elegant surroundings. 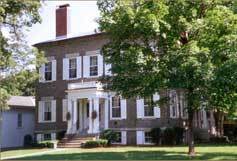 Listed as an official National Historic Registry site, the Manor merges early 19th c. and Victorian period decor with modern ease. Grand staircase, French mural, 1800's kitchen and servants quarters. 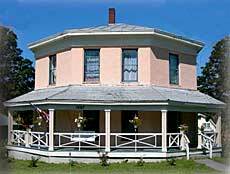 The Preferred Manor was a stop on the Underground Railroad. Convenient to all CNY attractions. Upscale bed & breakfast offers a recreation room with fireplace, 9' pool table, surround sound, and videos. The kitchen/dining room can seat 40 people. Internet and fax services, player piano, hot tub, heated pool, and more on 100 acres with pond and wildlife habitat of "pure serenity". Available for special events like corporate meetings or reunions. They're pet friendly too! A separate renovated carriage house, overlooking the valley with three comfortable rooms to choose from, decorated with a country theme throughout. Spacious views and beautifully landscaped gardens. Fine dining on the premises (well known for their Friday seafood buffet and Sunday brunches). This is a cozy lodge in a beautiful country setting that is scenic and secluded. There is a fully equipped country kitchen available for preparing meals and snacks, living room and dining area. On the banks of the Chenango River, this 1851 Italianate style, historic home offers original charm and character. Modern amenities have been added to create a comfortable stay. Guests can enjoy exceptional views of the waterway. Located between Bainbridge & Sidney, with easy access to I-88, this motel offers comfortable lodging, at an affordable rate year round, with no increases for seasonal events. Color cable tv, AC, wireless internet, microwaves, and refrigerator in all rooms. The Inn's historic and innkeeping traditions have been preserved. Thirty guest rooms, with shared or private baths, offer both lakeside and woodside views. Junior and Country Suites are also available. There are no phones in the rooms. All guest rooms are nonsmoking. We currently have 16 recently renovated and redesigned deluxe rooms and suites available from $79.99 to $199.00. All rooms have A/C, Wireless Internet and Cable TV on a flat screen, private bath and suites feature a queen size pullout. We also have a new lunch, dinner and brunch menu open to both guests and the public. New guest accomodations with full room service, provides voice mail, big TVs, hairdryers, irons, coffeemakers, and microwaves in every room. Free unlimited high speed internet. In-room Jacuzzi & fireplace suite, as well as a handicapped accessible room available. Restaurant open 7-days a week. This full service hotel has renovated rooms on three floors. They provide a heated indoor pool, saunas, honeymoon suite, and deluxe suites. All rooms are equipped with coffee maker, iron/ironing boards, blow dryer, color and satellite TV, AM/FM alarm clock. Studebaker's Classic Grill and Pub is available for dining. North America's finest economy lodging. Complimentary continental breakfast and free 24-hour coffee/tea bar. Free local calls, newspaper, AC, cable TV and Free HBO. Pets allowed. Facilities: 660 acres (bordering on 11,000 acres of state forest land) with 198 campsites of which 158 are trailer sites, the remainder are tent sites; Bowman Lake is a 35 acre man made lake that is stocked annually with rainbow and brook trout. Provides hot showers and flush toilets, nature trails, nature center, pavilion, playing fields and playground. 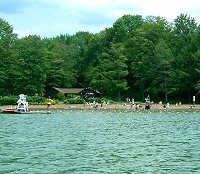 Activities: Swimming beach, fishing (valid NYS fishing license required), paddleboats, rowboats (rentals); nature and hiking trails, cross-country skiing, snowmobiling and picnicking. During the summer, fun family events and entertainment are offered such as interpretive walks, craft classes, singers, and clowns. Open year round. A portion of the park is open for deer hunting during gun season. Facilities: 65 Campsites with electric and water hookups. Laundry room available. Activities: recreation hall, boat launch, boat rentals, bait & tackle shop. Chenango Valley State Park is an ice age wonder. Its two kettle lakes, Lily and Chenango, were created when the last glacier retreated. Today, fishermen will find trout, bass, perch and bullhead in Chenango Lake. Facilities: 1,071 acres with 176 campsites and 24 cabins, 18-hole golf course, hot showers and flush toilets, nature trails, playground. Activities: bicycling, fishing, golfing, hiking. Ice skating, sledding and cross-country ski trails attract visitors in winter. Open year-round, from sunrise to sunset. Facilities: 164 acres with 40 camps sites, 22-acre pond, 1.25 miles of hiking trails, pavilion and play area. Facilities: 30 campsites on 17 acres. Activities: 200 ft of river frontage, fishing dock, small boats acceptable. Restrooms, free hot showers, dumping station, Cable TV & phone at some sites. Facilities: 80 sites for tents and trailers, 29 economy cabins, and a group bunkhouse that will accommodate up to 120 people. Indoor & Outdoor pavilions, restaurant and bar. Activities: Boating & hiking trails are available and fishing is allowed with no license required. Gilbert Lake State Park's lake and three ponds lie in wooded, hilly terrain in the foothills of the Catskills. Facilities: 1,569 acres with 221 campsites (7 electric, RVS allowed) and 33 cabins, 38-acre Gilbert lake, hot showers and flush toilets, nature center, pavilion, playgrounds and a frisbee-disc golf course. Activities: bicycling, swimming, boating, cross country skiing, snowmobiling, sledding, more than 12 miles of interconnecting trails for hikers and snowshoeing. Open all year. Deer hunting, bow only, is permitted in the park during gun season. Facilities: 17 campsites (11 with water, electric, sewer, television & telephone hookups; and 5 tent sites), shower and flush toilets. Activities: On the river for fishing, boating, swimming. Walk downtown Bainbridge. Facilities: Tall Pines Riverfront Campground, Canoeing & Country Store features RV & tent camping in New York's beautiful farm country on the banks of the Unadilla River. Our 67 Riverfront and Poolside sites, air conditioned luxury RV and Apartment Rentals, easy Pull Thru sites, and NEW Waterfront Supersites offer something for everyone. Plus, you will enoy delicious food every weekend with Pancake Breakfasts, Chicken & Rib Barbeques, Pizza Nights, Ice Cream Socials and More! Within a half hour of most major attractions. Activities: Rated 5 STARS by Woodalls our recreation program is second to none! Join us for a canoe or kayak trip on the Unadilla River; spice up your weekend with our Theme Weekend activities - everything from Pirates & Princess Week to Death by Chocolate; visit our fully stocked country store and enjoy an old fashioned ice cream from our soda fountain; relax by the pool, play at the arcade, playground, rec hall, or indoor playroom; try out your putting with our new mini golf course or cast a line and catch Bass, Walleye, Trout and more right from your campsite! Recreation: Canoe & Kayak Trips & Rentals, Inground Pool, Arcade, 18 hole Miniature Golf Course, Playground, Indoor Toddler Playroom, Rec Hall, Basketball, Volleyball, Horseshoes, Picnic Pavilion. Daily activities & theme weekends. Facilities: 75 campsites all with water, electric, and sewage hookups on 120 acres. Also has on-site restaurant. Activities: Swimming pool, recreation hall, game room, playground, cross country skiing, hiking. Facilities: over 180 campsites on 235 wooded acres. Pull-thru, lakefront, full-hookup, tent, & seasonal sites. One & two room air-conditioned log cabins; air-conditioned luxury trailer rentals; hot showers; commercial laundromat. Snack stand and fully stocked camp store. Activities: Row boats, paddle boats, canoes, barracudas, pedal kart bikes, 3-wheelers, four seaters, pool with large sun deck, picnic pavilion, 18 hole miniature golf course. Playground: Basketball, Tennis, Horseshoes, Sand Volleyball, Bocce' Court, & Wagon Rides. Daily activities & theme weekends.